A less is more approach isn’t one traditionally taken by a successful fashion label, but then Untouched World founder Peri Drysdale isn’t one to play by the rules. Doing things differently is, after all, what has cemented her place in the upper echelons of entrepreneurial royalty. 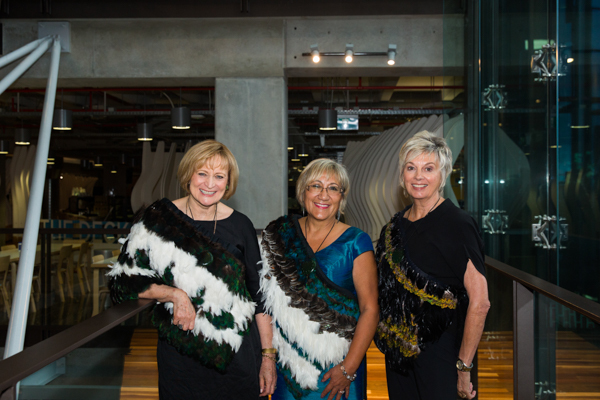 New Zealand Hall of Fame for Women Entrepreneurs inductees, Untouched World founder, Peri Drysdale MBE (left), entrepreneur and prolific director, Mavis Mullins MNZM (centre) and Fashion Week founder, Dame Pieter Stewart (right). Metropol talks to Peri about her recent achievements and striking a sartorial chord. How does it feel to have been recognised at such a high level, as one of the 2018 Company of Women Entrepreneurship Hall of Fame Inductees? It was humbling to be recognised amongst such a group of enormously courageous and successful NZ women. However, I am only the face of our company and our success is the result of incredible input from amazing people I have had working alongside me now and in the past, and with fantastic family input and support. Can you take us back to the start of Untouched World, what sparked the idea for the business? As I travelled around the world selling our knitwear I had become extremely concerned about the trajectory the planet was on. I could see environmental degradation going on from visit to visit. Government and business talk the world over was all about GDP and financial bottom line. I worried about what could one person, one company could do. The problem was so big, but I came to the conclusion that we had to do something about it. So, long story short, we decided to create a sustainable lifestyle fashion brand. I wanted a brand that would model a new way of doing business, that would highlight that style and quality could be achieved without pollution to water and air, filling landfills or treating workers poorly. Back in those days sustainable clothing had a hemp sack reputation, but I wanted to reach people who were in a position of influence to really make a change. So we had to create luxurious, high quality products that would appeal to that market. I also wanted a brand that would give back, put its money where its mouth is and wanted a project to coalesce the stakeholders and get them thinking about what was happening to the planet. So, Untouched World was born – with the bold vision to use fashion as a vehicle to champion what is possible for our planet and its people. Why do you think the business story of Untouched World struck such a chord and, as a result, has become such an incredible success? Untouched World is a brand of enormous depth, the kite logo and brand story has an incredible resonance with people all over the world. It is creative, different and has a great energy. People talk about finding Untouched World inspiring. The fact that we built the brand on a sustainable model, though ahead of its time from a commercial point of view, meant that we have been global leaders in this space, so have always had highly engaged followers. Strangely after nearly two decades, Untouched World still feels fresh and ‘new’ to me. You are one of the country’s most successful entrepreneurs, what has been the winning formula for you – hard work, dedication, passion, a great product? Ha ha! All of the above! I think stickability; an utter belief in what you are doing and being prepared to do things differently are key. What has been some of the best advice you’ve ever been given? Early on, it was to not go into partnership with someone else. We looked at partnerships a few times. I was given the sound advice that a partner who shared the same motivation and goals during a start-up phase, wouldn’t necessarily share the same vision in years to come, which could ultimately result in more effort going into running the partnership than the business. Early on it is tempting to take partners on as you don’t know what you are doing. Keeping control has meant we have been able to stick to the values that underpin the business, the raison d’etre that gets me up in the morning. Pretty much everything! I love it all. I love the people – our team, our customers, our suppliers, our foundation team. I love the design and creative process as well as production. I wake up and look forward to another day.